Successfully Added Digital Pocket Video Recorder (8GB Edition) to your Shopping Cart. Digital Pocket Video Recorder (8GB Edition). 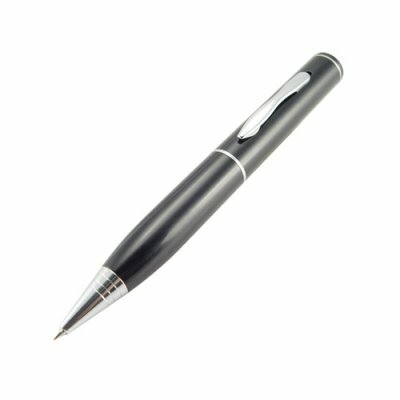 This is a beautifully presented camera pen framed with a classy, gloss black exterior. Designed to look and work as a fully-functioning business pen, it is actually a DV camera for recording motion video or to still photographs of unsuspecting people. With its deceptively normal exterior, this is the perfect blend of modern technology and conventional stationery for all aspiring secret agents! Easy to use and practical, this is an elegant and compact pen designed with portability in mind so it fits unobtrusively anywhere. This Pen would be perfect for those work within business, education, HR, security, media, press relations, tourism and many other areas. This is a truly flexible and desirable item that can be used by anybody, anywhere! Place it on your desk, on a shelf, or in your shirt pocket - it is the perfect covert device! With a spacious capacity of 8GB flash memory, you can be confident of never missing any important information. Record hours of business meetings or interesting events on the sly. Stay one step ahead with this incredibly fun and novel gadget. This fantastic pen can also be used as a standard USB memory stick to conveniently transport your important computer files. In stock now for your single piece or stock orders. Available exclusively from the number one wholesale source for surveillance cameras, Chinavasion. Features AVI file encoding on-the-fly, no need for complicated file conversion. The product does not have a dedicated sound/voice recorder function. Thank you chinavision, i already receive your digital pocket video recorder its very good and the video is clear and good for my courses in class. on 2010-02-01 05:18:20 It is webcamera!!! and photocamera too. 3) (USB-disk) флешка 8 гиг, для записи и видео и всего чего угодно, вставляется в юсб разъем без переходников. 4) (webcamera for Skype too). Вэбкамера. На сайте об этом ничего, но в инструкции есть. После подсоединения к компьютеру и определения ее как флешки, нужно нажатьт на колпачек 2 секунды. И устройство превращается в вэбкамеру (без драйверов), которая отлично работает в Skype (1.3 Мп). I am from indonesia. this product is very powerfull for my job. And thank you for chinavasion.com for quick delivery to me. on 2009-06-17 15:24:51 Great stuff! This DO is NOT some simple gadget. It takes photographs and makes movies. OR you use it for fun or ANYTHING else, FROM dusk till dawn, CHINAVASION has the perfect item for you! I think this is the bewst item for investigations.